The Euthyphro of Plato is among the earliest recorded accounts of the dialog between the philosophers and the theologians, of the conflict between reason and faith. The “wisdom” Euthyphro receives from the gods through the poetry of Hesiod and Homer is challenged by the wisdom available to the “natural” reason, as manifested in the probing questions of Socrates. Euthyphro, who claims to know more of these matters than the ordinary run of men, is shown to know very little when subjected to the test; the contradictions in his position, derived from the poetry, will not stand up to the questioning of philosophy, derived from reason alone. And yet, it is fair to ask whether we, as Christians, can so blithely accept Euthyphro’s defeat when we ourselves, and in our own literature, bear equally the charge of contradiction on a daily basis. Can we accept so easily a faith that is bound by reason and must we deny to theology its own methods and sources, apart from philosophy? Speaking as a theologian, I find it necessary to defend the art of our guild, even when practiced by one so artless as Euthyphro. Whichever “wisdom” will “win,” the Euthyphro is a carefully constructed work of literature rich in its use of irony. Euthyphro and Socrates, the seer and the sage, are both drawn to the court by issues of impiety, one to make such a charge and one to be so charged. The irony is compounded by the fact that the seer is present to prosecute his own father, a most impious act in the eyes of his countrymen. 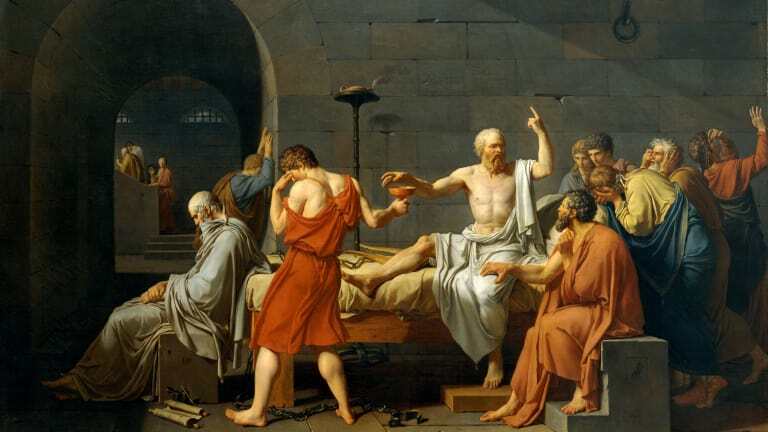 Seeing that Euthyphro knows enough about piety to commit such an act, Socrates becomes his student, somewhat disingenuously, in order to learn some defense for his own trial, and Euthyphro promises to help him. But the sage is able to learn little from the seer, despite the fact that Euthyphro offers no less then seven definitions of piety. All are found wanting by the philosopher, who begins with a rejection of the poets upon whom Euthyphro depends. In the end, the irony is made complete as the befuddled theologian departs the court, abandoning both the threatened prosecution of his father and the promised defense of Socrates; the philosopher meanwhile remains to face his own trial alone, without the help of revealed theology. Human wisdom alone must carry the day, as it has already carried off the theologian. Socrates’ critique of Euthyphro turns on three questions: the believability of the myths, the unity of the lovely and what is actually loved by the gods, and the unity of justice and holiness. The first question is actually the basis of his own trial; he tells us that because he rejects the myths, people believe him to be sinful. Socrates seeks only the “essential form” of the holy and the unholy, not their poetic representations. Poetry is a bad place to search for essential forms, for poetry moves us by metaphor through the particular towards ideas it assumes to be otherwise inexpressible. The unity of the lovely and what is loved by the gods is also rejected, and not without support of the poets themselves. Since the gods war with each other, they cannot agree on what is good; hence there must be different goods to different gods. And just as clearly the good must be something apart from the gods; hence the opinion of the gods cannot count for more than the opinion of men; the gods might be powerful, but they are not thereby truthful. Men must be able to grasp the truth apart from the myths, and this is especially true as the Muses themselves are prone to lying; man must develop his own wisdom, since he cannot trust the wisdom of the Muse. Further, since the gods may love what is not good, then the good precedes the gods and stands above them and ought to rule them, just as the philosophers ought to rule the state. This is the “good” at which Socrates aims, whether or not it is loved by one, all, or none of the gods. Aside from dividing truth from poetry and the good from the gods, Socrates divides justice and holiness. The service of the gods and the service of men become two clear and distinct things, only one of which involves piety. This service of the gods is conceived to be in the same class as the service of horses or of dogs, something done to improve them. But since neither party can agree to such a thing, the dialog degenerates, until “piety” becomes no more than an exchange of goods, sacrifices to the gods in exchange for blessings on the family and the state. Thus piety at best becomes a divine commerce, neither more nor less noble than that which takes place in the agora. Against this, Euthyphro can only re-assert his original definition; threatened by Socrates with repeating the conversation from the beginning, the Theologian flees the scene, abandoning both father and philosopher to their fates, and the philosopher must continue alone. It is this search for the essence of the good, apart from its shifting expression in the world of “things,” which compels the reason that is at the heart of the wisdom of Socrates. His method, as we have seen, is the method of analysis, of continually dividing things until their indivisible elements are reached, along with the chain of causes that connects them. In this way, Socrates gets to the essential form of all things, which is found to be the pure and pre-existing ideas. Moreover, he subjects not only the theologians to such analysis, but the statesman, the poet, and the artist as well; all are found lacking in wisdom, all have failed in proper analytic technique. The knowledge that Socrates seeks is objective, since only an object may be analyzed; the subjective remains always either slightly beyond reach, or beneath it. Indeed, the gods themselves must be subjected, like all else, to the test; no longer are they active subjectswhom men must seek to placate, but objects, like everything else, to be analyzed. The analysis does them ill; in the end, it is only the philosopher who is fit to govern; indeed, it is only the philosopher who is fit even to breed, or at least direct the breeding of others. Nor is it an easy task to overthrow this reasoning, however uneasy it may make us feel. For the logic of the pure ideas is indeed compelling in the face of the confusing complexity and changeability of the real world. This leads us directly to the question, “Is there a wisdom apart from philosophy, or is everything, even the gods, subject to its analysis?” In other words, does the “natural” theology of the philosophers bind even God? Hymns to the pure ideas are rather rare, and liturgies that invoke the primum mobilum are not well attended. When the philosophers search for God, they tend to find him among the pure ideas, or to imagine him as the immutable “unmoved mover.” That these ideas flow irresistibly from the logic is undeniable. However, in what sense they are “natural” is another matter. If we assert that they are “natural” in the sense of compelling the rational belief of all men, then it must be pointed out that such ideas are the exception among men, rather than the rule. Hymns to the pure ideas are rather rare, and liturgies that invoke the primum mobilum are not well attended. Even in religions that accord these ideas a great deal of respect, such as Christianity, their place is mainly confined to the higher realms of theology and they rarely intrude themselves on the liturgical or prayer life of the community. It may be that they are “natural” in the sense that the trans-uranic elements are natural; that is, they certainly express possible relationships in the order of nature, but are not actually found in the natural world outside the laboratory and only when created by the hand of man. Must we then abandon the idea of a natural theology, or limit its reach to the philosophers? We find that all peoples believe certain things about the divine, among which are that the divinity is reached by prayer, ritual, and sacrifice, and that it is spoken of primarily through poetry and metaphor. But there does seem to be a “natural theology” which has in fact compelled belief from all men, whether peasant or philosopher, or at least from all cultures. However, this theology is not reachable by the tools of philosophy per se, but by the tools of theology, oddly enough. Specifically, it is reachable by applying the Vincentian canon (“that which is always and everywhere believed”) to the entire world and all of its traditions. The canon is designed as a test for Christian tradition, but works as well for tradition in general. When we apply this canon, we find something remarkable. We find that all peoples believe certain things about the divine, among which are that the divinity is reached by prayer, ritual, and sacrifice, and that it is spoken of primarily through poetry and metaphor. This is really a counter-intuitive result, especially if one’s intuitions have been formed by philosophy. For there seems to be no chain of reasoning, starting with any arbitrary “first principles” you like, that ends in the conclusion, “and then you place a lamb on the altar and kill it.”Indeed, the “rational” mind has a great deal of difficulty connecting the dead lamb to the living God, and yet that is what all peoples do, or something very like it.It may be, as Socrates seems to suspect, that such things are the product of ignorance. Yet, given the ubiquitous nature of the belief, this explanation seems flawed; one would expect correct reasoning to always reach the same result, while ignorance and error would always march off in all sorts of different directions. But it is the philosophers who can’t seem to agree, while the mass of men is united on these very points. The very fact that all men seem compelled to do these things and to think in these ways indicates that there is something “natural” in man that compels him thus, even when his intellect, by itself, would rebel at the thought. I suspect that this “natural” thing in man is his power to integrate not only his thoughts but also his experience of the holy. For man must not only analyze, he must also synthesize and, mostly, he must act. And the power of man that allows him to integrate all of the diverse elements that the philosophers divide is his experience of the holy, something he experiences mainly as a lack. It is the discovery of the “empty space” within himself that leads all men to kneel at the altar while offering sacrifice and repeating words that are poetic. It is not something “deduced” from first principles, but something to which man’s ordinary experience seems to compel him. Euthyphro discerns that the gods are in some way the exemplars of virtue, a thesis no Christian would deny. But Euthyphro cannot define the way in which the warring gods exemplify; a Christian would locate his failure in following the wrong gods, or rather in following gods instead of God, and especially in following gods who lie and make war and love with equal abandon. However, the Christian ought not to be too superior on this point, since the God of Abraham is not above deceit in guiding his people, as Ahab and Jeremiah discover (cf. Jer 4:10, 20:7; Ezk 14:19; 2 Chron 18:18-22). And likewise He is capable of hardening men’s hearts, which is a way of hiding the truth from them. He also, like his Pagan “colleagues,” leads armies in battle and sternly orders the destruction of cities and peoples. Indeed, the only vice denied the God of the Hebrews seems to be sexuality, but this may merely be one of the drawbacks of being a Unitarian divinity; there’s no one to fool around with. The later prophets and the Christians will correct this deficiency by imposing a rich sexual imagery on the love between God and his people. Of course, the modern reader is likely to interpret all of these passages out of existence, but for the ancients, they express the truly rich and paradoxical relationship of God and man. Hesiod must therefore be confronted head-on. Euthyphro, absent the doubts raised by Socrates, is content to let the complexity of the world extend even to the heavens. Euthyphro comes very close to the truth which is at the heart of all truths when he identifies justice with service to both gods and men. Replace the word “service” with the word “love,” and you have all of the Law and the prophets as well. But since he has allowed Socrates to divorce piety and justice, the moment passes, a moment that might have been decisive. Hence that moment will have to wait for another seer, and one more than a seer. For the moment in question, the seer is driven off the stage, and faith and reason go their separate ways. It is not a denial of human wisdom per se, but rather the recognition that such wisdom by itself is not complete. The wisdom of Euthyphro consists in this: an integral view of the cosmos based on a faith in divine persons as they appear in the sacred literature. This is remarkably similar to the Christian faith (or indeed, to any faith) and if it is not wise for Euthyphro, then neither can it be wise for us. This “wisdom” is, I believe, the “absurdity” to which St. Paul refers when he speaks of “shaming the wise.” It is not a denial of human wisdom per se, but rather the recognition that such wisdom by itself is not complete. Instead, it takes the “absurdities” that are common to all men, the absurdities of prayer, ritual, sacrifice, and poetry—the absurdity of faith—to complete the work of reason. Can we therefore dispense with the wisdom of Socrates? We certainly cannot. For whatever else may be said, the sage does bring to the seer to the knowledge of his own inadequacies, which is the most important knowledge in the world. Euthyphro’s initial confidence is broken when the metaphysical ground beneath him shifts from radical faith to radical doubt. One by one, his assumptions are broken, until he is left with no place to stand. Hence, he must leave. And this must be the course of paganism; its mythos must always be at war with its logos; one must “win” and the other “lose”; one must stay, and the other go. And if one does not refuse to go, as Socrates refused, he must be killed. Does Christianity escape this conundrum? Yes and no. Yes it does, because the true Logos is already united to its “myth”; the account comes to us not, in the first instance, as a received doctrine, but as a story told and re-told as an always new yet firm tradition, always repeated liturgically and embodied socially. All possible disputes between mythosand logos, between Hesiod and Aristotle, have already been resolved in the person and life of Jesus, the true Logos. But while they have been resolved in the life of Christ, they have not yet been resolved in our understanding of that life, a process which takes place only within history. The kingdom, which is already begun, is not yet realized in the world, and within that temporal field, we must still struggle, and struggle mainly with our own failure to both comprehend and actualize the Word in the world. Because all the conundrums have already been resolved, in fact if not in understanding, then Christianity can expose itself to philosophy in a way that is impossible for paganism. Christianity may do so in perfect confidence that however much she may for a moment stumble, she will not fall. She will neither have to flee the court nor kill the sage. Sage and seer may find themselves at odds, but at base they will always turn out to be the best of friends. But for all that, the seer must be the elder, and the sage the student; theology must maintain her pre-eminence over philosophy, even while she cannot ignore the questions of her sometimes subversive subject. Only in this way can her intellectual tradition advance towards its final consummation. Theology is the queen of the sciences, and this she must remain; but she is a queen-motherrather than a tyrant; she listens to her subjects with care, even as she keeps her own counsel. Jesus Christ says something rather remarkable about this subject: He claims to be “the Way, the Truth, and the Life.” This means that the truth is, ultimately, not some object, such as a pure and distinct idea, but a subject, an acting, self-aware person. And persons are known in a way that is fundamentally different than objects. Persons are known in love through faith, hope, and trust. It is equally true that our knowledge of the divine persons is mediated through all of the objects which are known as “creation,” objects which may be known through analysis and all the techniques of science and philosophy. Thus our knowledge of the world and the world’s creator comes from two sources: objectively through the objects in the world and subjectively through faith in the creator. Philosophy claims a pre-eminence over the world of objects and ideas about objects, and this claim cannot be denied. Anyone who would study the world must, whether he realizes it or not, study some philosophy and begin with some principles. He may or may not be aware of these principles, but they are always there. But philosophy, by itself, can never be sufficient, for the world of objects does not exhaust the totality of being; indeed, it does not even exhaust the being of the philosopher. Ultimately, being resides in the divine persons, and these persons can only be known in faith and love. When the philosophers derive their god, they tend to derive an abstraction. This abstraction, no matter how true and logical, can never be loved because, properly speaking, only persons can love and be loved. Thus the god of the philosophers engenders no myth, has no prayer, no liturgy, and no ritual. But these are precisely the way that man relates to God, a God that is somebody rather then something.